I’m featuring this recipe for a few reasons: First, we’re having such unseasonably warm weather here in California, it may as well be summer and perfect for picnicking. Second, it’s football season and I hear a lot of people go in for that. The Sandwich would rock a Monday Night Football Party, or weekend game party, for sure. Lastly, it’s so good I don’t want to keep the recipe to myself. Every time there’s some sort of [name event] in a park where people will be bringing food to eat or share, The Husband asks for The Sandwich. Usually, The Sandwich has taken so long to make, but luckily this last time I was asked to make it as we were outside Via Maestra 42, a Italian restaurant/deli on Upper State Street here in Santa Barbara. I clocked some grilled zucchini and eggplant behind the counter and bought it all. That saved a huge amount of time, because grilling up a bunch of veggies after meticulously slicing them thin on a mandoline isn’t easy, nor is it quick. Especially when you’ve got to be careful because you and the mandoline have had a little history together. Yes, I’ve learned to respect the mandoline. It bites. 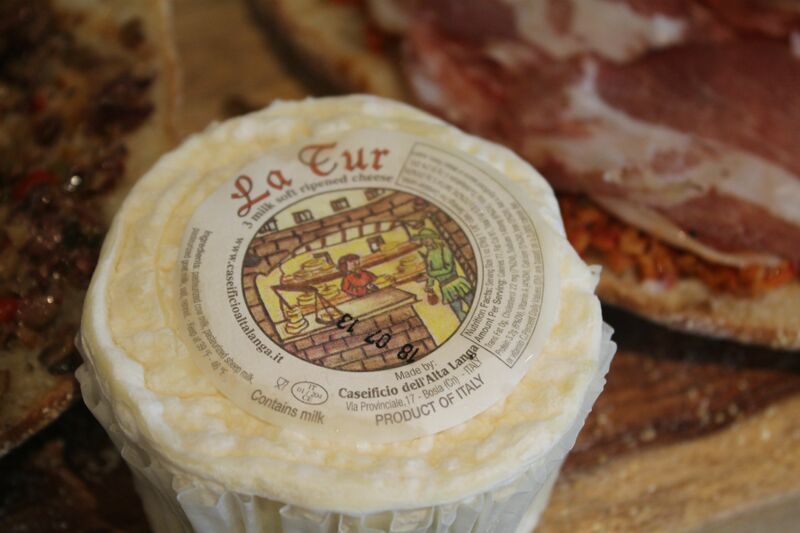 The cheese I usually use for The Sandwich is an Italian soft cheese made from sheep, goat and cow’s milk called La Tur. 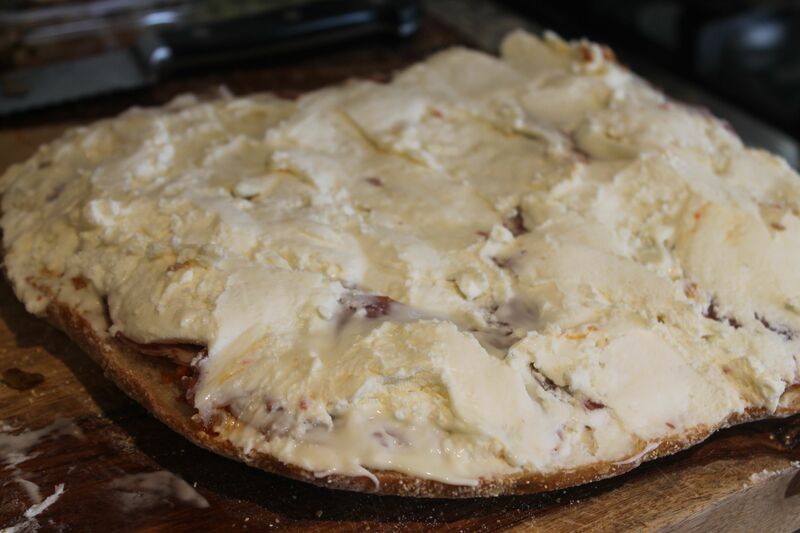 It’s so delicious, but you can use whichever kind of cheese you like best, even firmer cheeses, just make sure you get enough to make a full, hefty layer in the bread you choose. At Via Maestro 42, I also found this delectable spread from Tutto Calabria, a spicy tapenade of sorts. I think this is it, but mine is in English and everything on this site is in Italian! It gave The Sandwich a nice kick, but the original recipe just called for pesto, which is what I usually use. Another good substitute would be a mushroom paté, like a duxelle, if you’ve got that laying around. This is a make-ahead dish, and is best after sitting overnight, so please do plan ahead, especially if you’re doing the grilled vegetables yourself. The Sandwich is best shared, mainly because it’s large. But be careful if you taste it before going to the event. You may pretend to be ill and sit in a dark room and finish the thing off by yourself. Yes, you’ll feel sick from both the lies and eating all that food, but mainly you’ll be very, very happy. The ingredients list is going to be pretty loosey-goosey here, because I’ve got no idea how big the loaf of bread you’re going to buy is. Actually, it’s hard to predict what size bread I’m going to find, so just buy more than you think you’ll need, as most of the ingredients go well in other things, like a pasta sauce, for instance. Cut the ciabatta in half through the center, like you would any roll for a sandwich. Hollow out the inside of the bread a bit, leaving a fairly substantial crust. Cover one half of the bread with a generous layer of tapenade, and the other with the pesto/paté. Then start building the sandwich on the bottom half of the bread. Start with your meats, covering the bread with an even layer. Then cover the meat with your cheese. 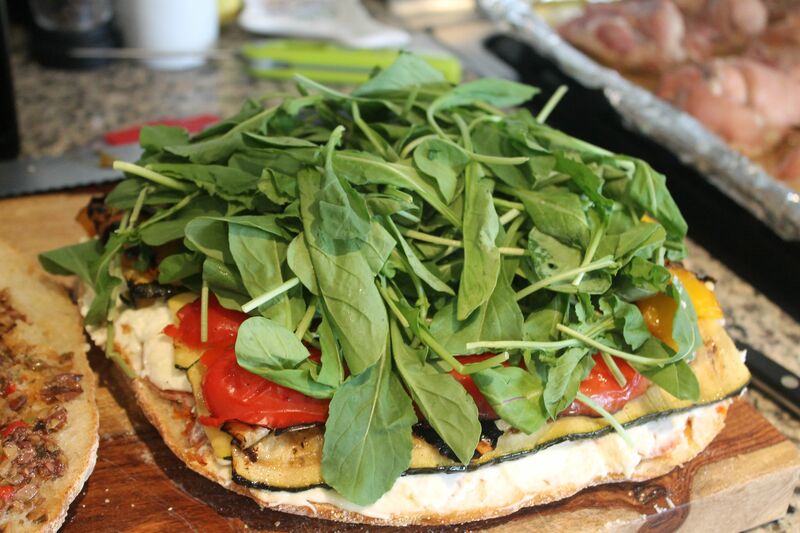 Start layering your grilled zucchini and eggplant, then the peppers on top of those. Lastly, cover the peppers with your leafy greens, as thick as you can. Then put the lid on your sandwich, as carefully as possible. Press down firmly. You might need some help with this last bit. You’re going to need to wrap this bad boy in a serious amount of plastic wrap. Feel free to wrap it in parchment paper first, but then mummify The Sandwich in some serious plastic sheeting. This will stop it from leaking all over your fridge. Once you get it hermetically sealed, place on a cutting board or in a large baking tray and carefully weight it down. I’ve used Le Creuset pots filled with cans of beans, or even another baking tray with canned goods or cookbooks on top. The Sandwich likes the pressure, don’t worry. Find room for it in the fridge and keep the weight on it all night. The Sandwich can be sliced beforehand (but then you might taste a bit, and not attend the event—don’t say you weren’t warned) or just bring a bread knife to the event and slice it there. 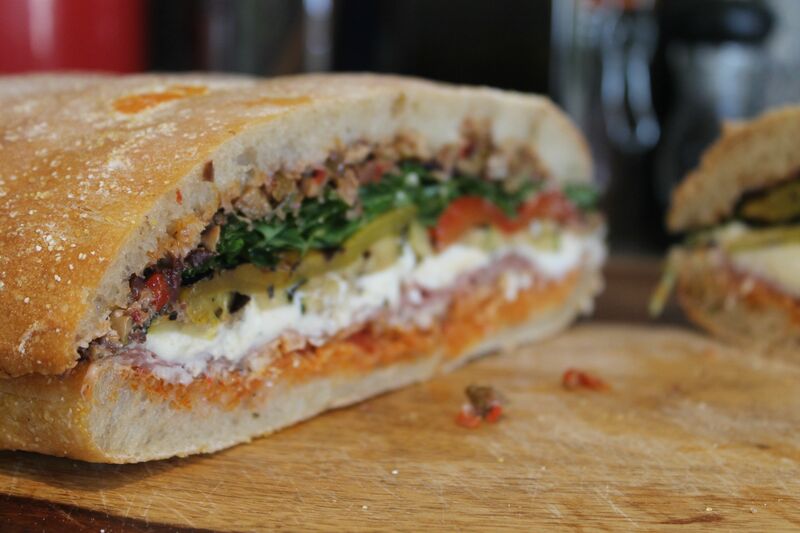 Then you can have a dramatic unveiling of The Sandwich, which is quite satisfying. That is, for the five minutes before it completely disappears, devoured by all your friends like something off a Discovery Channel show on hyenas of the Serengeti. * Courgette and aubergine, for my foreign readers. Although they probably knew that already. Great looking sandwich! Pesto and tapenade especially sound amazing. Thank you! It can so easily be made vegetarian too. I appreciate the comment! yum!! this sounds soooo good! 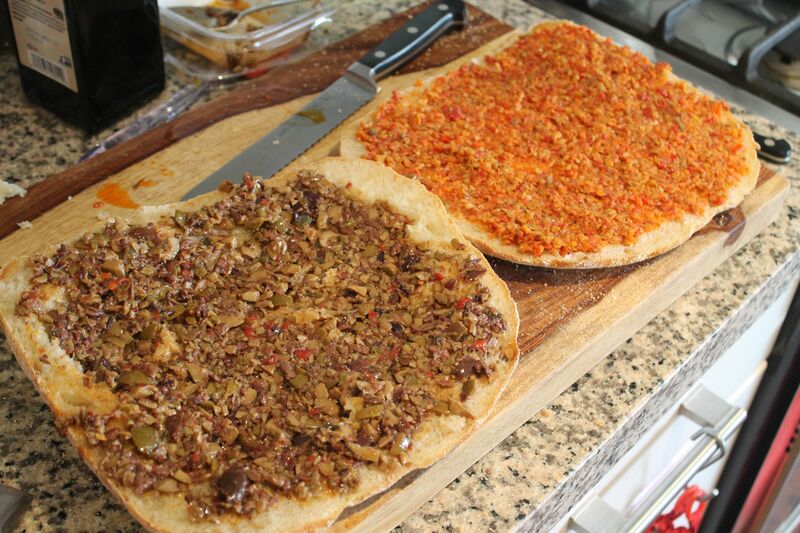 a combination of everything delicious! 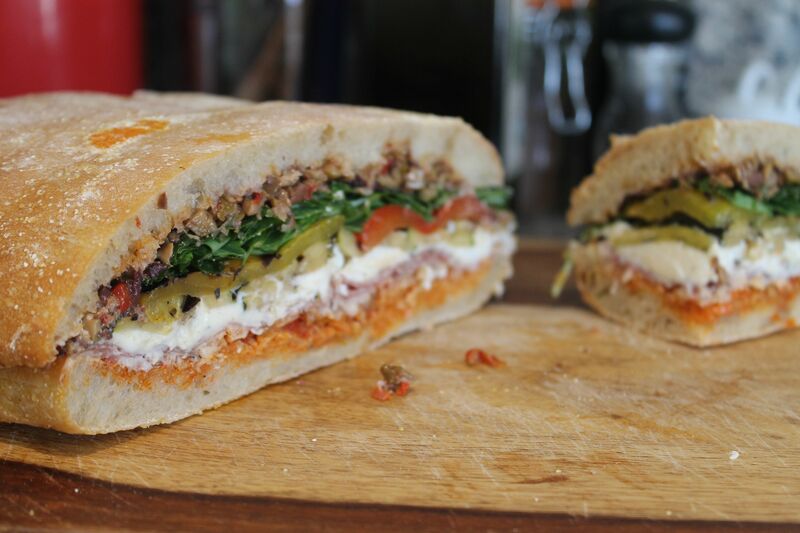 Epic sandwich, epic munching and delicious picnicking! I knew I had to come and check this out when I saw the title! If ever we get to go on a picnic together, you can bring the sandwich and I’ll bring along the roast, lol! Definite yum. I was thinking maybe some leftover porchetta? If unplanned, all bets are off. Hee hee. Can’t go wrong with p. mushrooms! Love this… must try it! thanks 😀 Finally have a couple of places that sell great breads so I can make it JUST like this… well…. you’d make it better… but I’ll try!!! T.J.’s has a pkg. 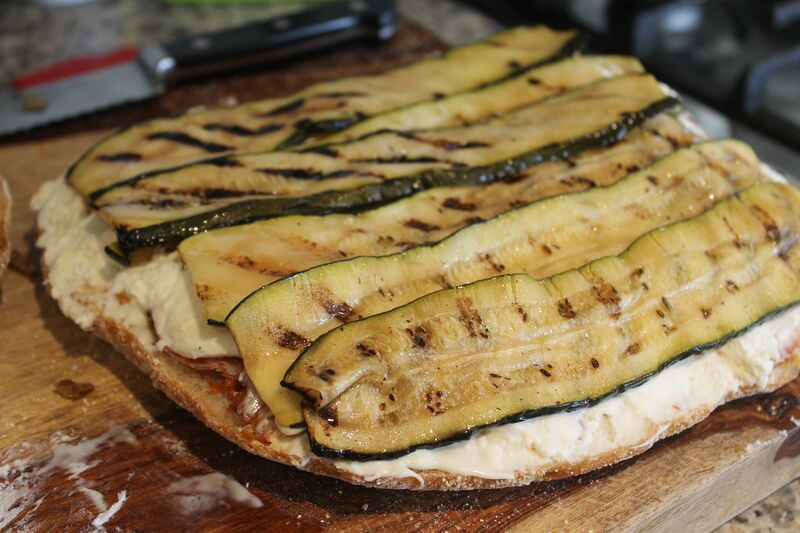 w/grilled eggplant and zucchini – very good, in the freezer section. THAT, my dear, is gorgeous. All I had to see was olive tapenade. I think you’d like the spicy pepper paste too. Just gave the tapenade a lovely kick! And thank you!! 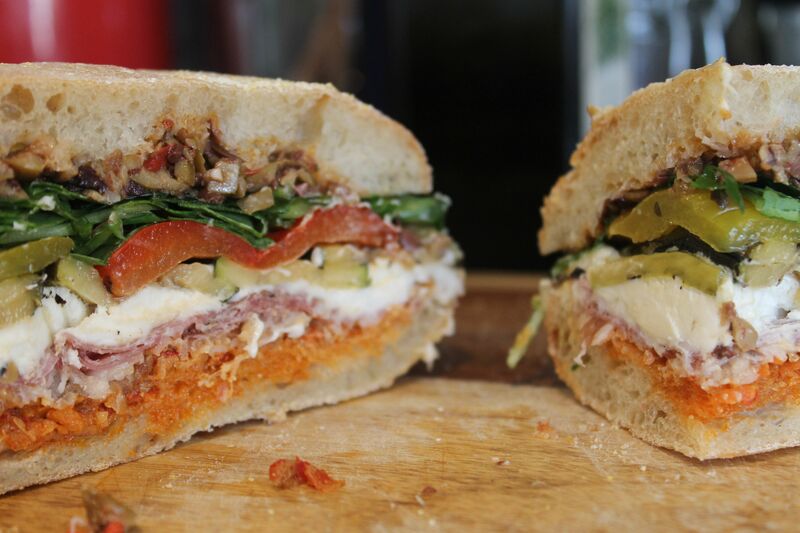 Oh, and I bet some of your homemade vegan cheese would rock this sandwich!! Ah that’s gorgeous! I want one NOW. That’s truly the most awesome sandwich I’ve ever seen! I’m makin’ that one! Thank you so much! 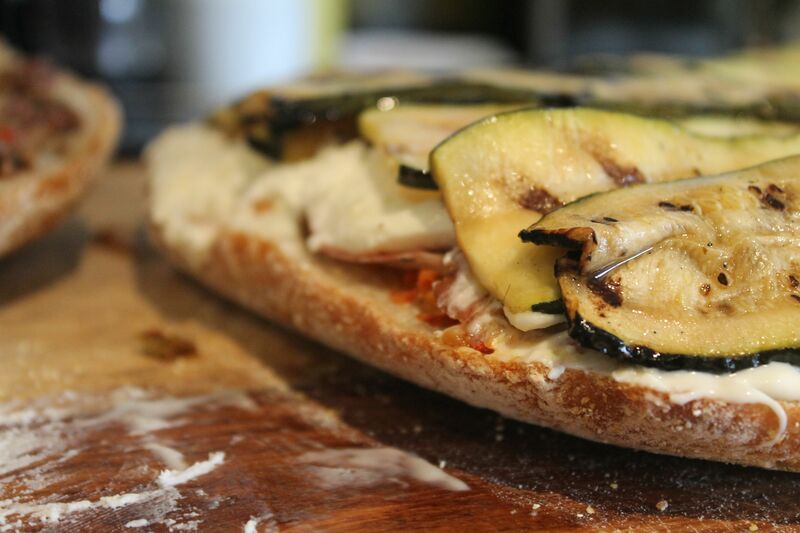 I’m sure you’ll whip up some homemade ciabatta which will make The Sandwich ultra-luxe!!! I have sandwich envy! I’m actually drooling right now. And CHEESE! love it. Lol, indeed! I did that tonight with goats cheese, yum! i guess since it’s picnic, i think the healty sandwich is just perfect for it..
i love the way you put the grilled pepperf for the stuffing! It’s not easy to find here either, and usually pricey! But there’s a lot of other cheeses that will work. 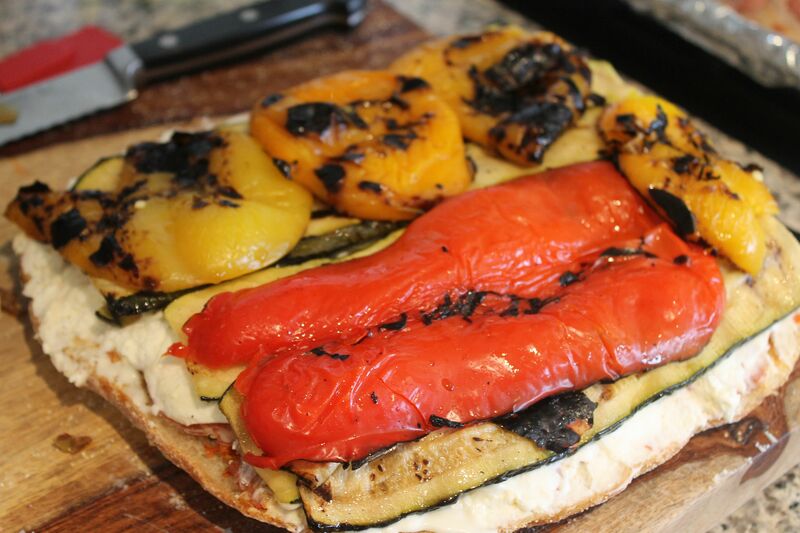 The grilled peppers give it a lovely flavor. I hope you make it some time! I don’t eat pork.. any suggestions on a substitute meat ? A smoked turkey would be nice, and honestly, just veggies and cheese is delicious! I’ve made it with meat and without, and both are wonderful. Thanks for the comment!